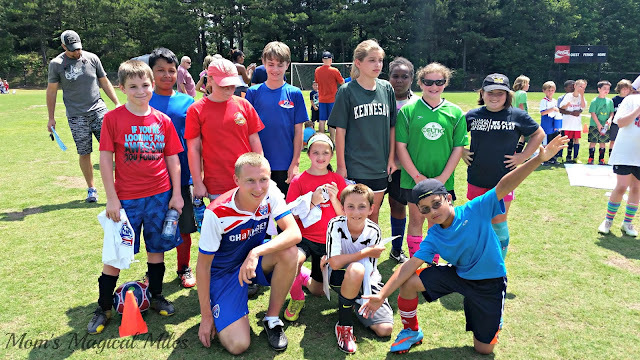 Challenger Sports Review by Amy Albers | British Soccer Camp - Score! Disclosure: I was provided with free registration for British Soccer Camp for purposes of review. All opinions are my own. We had barely been out of school for a week and I was schlepping my oldest to the only scheduled activity we had for him this summer. I had the opportunity to register him for British Soccer Camp through Challenger Sports. The boy is 13 and while he loves soccer, can be difficult to please sometimes. I was hoping this would be a good experience for him. He went every day for a week from 9:00a - 12:00p. When picking him up the first day, he greeted me with, "Can I do this camp again next year? And for full day?" Oh, haaayyyy. Promising, but let's see how the rest of the week goes, shall we? The camp covered a wide range of ages - from 6-14. 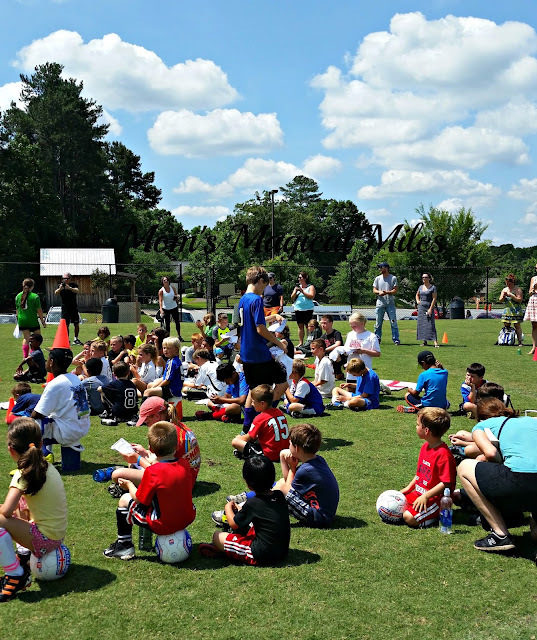 The kids were split up into teams and named after countries who participate in the World Cup. Every morning the entire camp would start off with games, but then break up into their smaller groups for more skill-based games. They would end each day scrimmaging with another group. Points were awarded each day not only for winning games, but for things like good sportsmanship and teamwork. Each afternoon the kids were given "homework" - decorate your soccer ball in your country's colors, make a flag for your country, find out the most interesting fact that you can about your country. Each day, my child repeated his request to return next year but for the full day session. On the last day of camp, parents were invited to come at 11 and watch the final World Cup matches. After each match up, the large group would come back together. The instructors would pick an MVP for that game. The MVP would stand up and the camp would yell, "Who's the man?" The MVP would then yell back, "I'M the man!" I was really impressed when watching the games - the coaches had instilled in everyone a sense of teamwork and concern for one another. Each child receives a soccer ball and a t-shirt with registration. 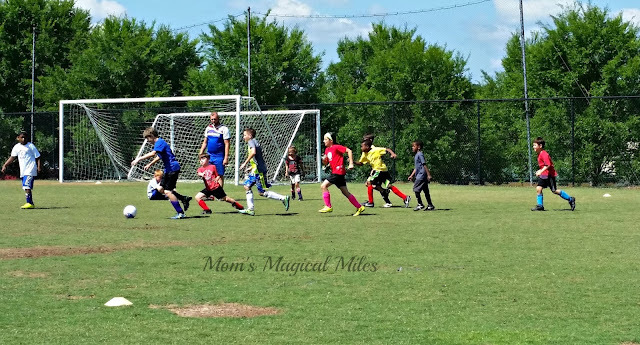 From what I saw and from what my son told me, the coaches were super nice and were not just trying to keep them busy. We received a personalized evaluation at the end telling us what my child's strengths and weaknesses were. This is not just a camp to fill your child's time over the summer; they are truly trying to build skills. The verdict? The request for registering for next year, full day persists. In fact, he wanted to register for another session, THIS summer. If your child is truly interested in soccer and becoming a better player, this camp is a great fit! I was very pleased and, what counts most, my child was pleased! There are still spots open nationally for camps this summer! Be sure to check them out here for registration information.